This little corner of Fethiye is in an area subject to major redevelopment at present, and often overlooked by residents and visitors alike, mostly due to being focused on the traffic hazard, I suspect. Since I took this photo it has been enhanced with the addition of a huge TV advertising screen on the island and a massive pediment fronting the jeweller’s shop on the left. There is also now, to the right, the major works of the Fethiye Amphitheatre Restoration Project and there seem to be more buildings on the hillside too. As I said last week, I’ve been getting the boat ready and not had much free time for painting but I’m really pleased to finish this scene as I think it highlights one of the easily missed views of this amazing place. 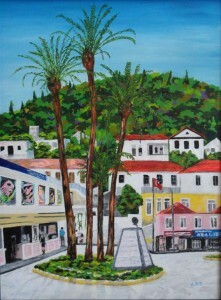 This entry was posted in Fethiye, Living in Turkey and tagged Acrylics, canvas, Fethiye, my paintings on March 22, 2013 by Tony Taylor.